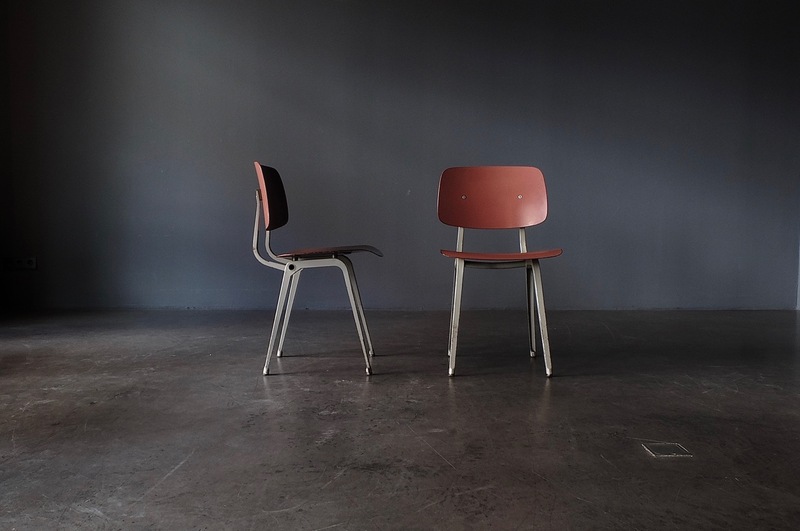 More about one of our favourite designers – the Dutchman Friso Kramer – and one of his most famous chairs: the chair 4060, called „Revolt“, produced by Ahrend-DeCirkel, first presented at the Milan Triennale in 1954. The steel U-profile frame supports the seat plate and backrest made of laminate. The Revolt was a declaration of war, a revolutionary chair – and yet not an immediate success. It came only in 1956, after a design exhibition in the Stedelijk Museum in Amsterdam (which, by the way, mainly showed German design). Meanwhile, the chair has not only made it into exhibitions and museums, but also onto a Dutch stamp, there is an entire book just to this chair and is one of the most famous Midcentury design pieces. At the moment we have a couple in brick-red in the showroom, frame light-grey.